We’ll be happy to meet you at your arrival and introduce you to Playa del Carmen. We kindly ask you to please give us a call when you’re entering Playa del Carmen and we will meet you at your Vacation Home. A few days prior to arrival, you will be emailed specific driving directions to get to your vacation rental. If your check in time is outside business hours (after 6:00 pm). Your Driving Directions email will include a Code that you will use to open a lockbox where you will find keys to access the property. Check in is at 3:00 pm. Check out is at 11:00 am. Checking out on time is very important for our housekeeper's and maintenance staff. They need time to prepare the home for our next arriving guest on that same day of your check out. If would like to be scheduled to arrive earlier or depart later, please contact our Reservations & Guest Service staff. For $100 nominal fee, you can check in two hours early (at 1:00 pm), and for an additional $100, you can check-out two hours late (at 1:00 pm). Checking out earlier or later than two hours requires purchase of additional day. Contact Reservations & Guest Services to make arrangements. Requests are based on availability and some restrictions may apply. If this is the first time you will stay in one of our vacation homes, you will be greatly surprised. 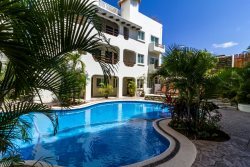 You can expect a quality villa or condo that is clean and equipped with everything you need to have a great time: bedding and linens, kitchen supplies, satellite or cable TV programming, WiFi, and some homes even feature BBQ grills, private pools and hot tubs. 1. Bedding and linens. Weather in the Mexican Caribbean require only sheets and a light bed cover, however there are extra blankets available in some of our homes. One bath towel per person, a beach towel and a face towel is standard. 2. Bathroom amenities. We provide bath soap, hand soap and toilet paper in every bathroom, so no need to worry about having the basics when you arrive. 3. Kitchen supplies. Basic cookware, serve ware, glass ware, cutlery, utensils, roll of paper towels, dish soap and new sponge are available for every arrival. 4. Cable or Satellite TV. Every home is different, some are contracted with Cable, Sky, Dish or Shaw TV, nevertheless, English speaking channels are available in most of these systems. 5. Internet. Again, every unit has different Internet suppliers. Unfortunately we can’t control these services but you can make sure we’ll do our best if an Internet fail should happen. We love to stay connected too! 6. Swimming Pools. Whether a plunge pool, common areas pool or private pool, we kindly request to use appropriate clothing and rinse before entering the pool, sun block lotion can be harmful for the pool chemistry and others. Daytimes sunny and warm, nights can be chill and windy. Wear a light sweater during the day, a few days a year long pants are a must. Days are very warm and dry. Do not expect a lot of rain. Days are warm and you can expect shower rains mostly during the afternoon. Don’t worry, the rain will pass in five minutes and the sun will go out again bright and shiny! Bring a Raincoat! You never know if days are going to be sunny or the whole day rainy and cloudy, but nevermind, days in Playa del Carmen are enjoyable anyhow! Time in Playa del Carmen is always the same, there are currently no changes for summer or winter time. GMT -5 hours is always the rule for timing in Playa del Carmen. Area code for Mexico is +52, area code for Playa del Carmen is 984. Remember, if you’re trying to reach a local cell phone, you have to dial 1 between 52 and 984. Although, Whatsapp is a very common app in Mexico and a great tool for communication abroad. Playa del Carmen is located 35 minutes south from Cancun Airport. It is easily accessible by the Highway 307. Taxis, shuttles and an ADO bus are also available just outside the terminal 2. If you arrive to terminals 1 or 3, there are shuttles that will take you to terminal 2 if you wish to take the bus or have more options for transportation. Our Guest Service team can book airport door-to door transportation for you or assist you in renting a car from the airport. Public Transportation in Playa del Carmen is not very comfortable, we highly recommend you to use taxis or rent a car or bike. Taxis are affordable and there’s plenty of them. There are different restrictions to buy liquor at the supermarkets and wine shops in Playa del Carmen. Usually it's around 10 pm on week days and 3:00 pm on Sunday. Please check on the store you’re buying to confirm timing. Remember, you can always request from our Guest Service department if you want your vacation home to be stocked with groceries and beer or wine. We love pets and understand they are members of the family too and travel with you. Remember all our units belong to different owners that have different preferences for pets, so we kindly ask you to check before with our Reservations & Guest Service team which are our Pet Friendly units. Pets are only permitted in our select pet friendly properties. There is a nominal fee of $100 per week or less booking and per approved pet, which is charged at the time of reservation. This fee is non-refundable and helps cover the cost of cleaning the carpets of residual dander and pet hair. Only small breeds are allowed in pet friendly homes (yorkies, chichuahuas, frenchies, boston terriers, pugs, etc). In addition, we will request a $500 USD refundable deposit for pets. No, the minimum length of stay in most of our homes is three nights. However, on select homes or Holiday season, we do require a minimum of seven nights booking. If you require to stay less than the minimum length of nights there is an extra fee from $72 to $115 USD. Please contact our Guest Service team for further details. No, with Vimex Vacation Rentals you have the freedom to choose start your vacation any day of the week. Most of our homes are equipped with our standard amenities. However, some amenities vary. Refer to property details for more details. Generally, each home includes bedding and linens, basic kitchen supplies, satellite or cable TV, internet, and select homes include a private hot tub or swimming pool. The listed maximum sleeping capacity is the maximum number of people that can be in the home at any given time during your stay day or night. This is calculated based on the number of total people the home can sleep (double occupancy - two to a bed), including beds and other alternative areas to sleep such as sofa sleepers and futons. There are a few homes where there are more spaces for sleeping than the listed maximum occupancy. It's designed to allow for different sleeping configuration, but is not intended to allow for more guests. Contact Reservations for further information. No. Children under 2 years of age we assume will not require a bed. Pack 'n plays are available for rent. Contact Guest Services to make arrangements. We don't provide cribs in our homes. However, we offer pack 'n plays for rent. Advance notice is required as there is a limited supply available and they sell out during peak seasons. Yes, some rental units accept pets under 5 pounds if they are well trained and do not bark. Please read the details for the individual rental unit pages. There is a $100 USD fee per week and pet and a refundable security deposit of $500 USD. You can wire the money via Bank of America. You can also send the payment through Paypal. Our Reservations team will assist you on your payment method. We currently take only cash for Security Deposit. Please read our vacation rental policy for more details. If you book online, you will get an immediate confirmation. If you choose to wire your money or do a Paypal transfer, then we will send you an email confirmation as soon as we see your payment reflected in our account. You can cancel your reservation by sending us an email with the reason for the cancelation. Please read our vacation rental policy for more details. If canceled 60 days, (or more) prior to arrival, you will get a 100% refund (minus 200$ USD handling fee). If canceled 30-60 days prior to arrival, you get a 50% refund (minus $200 USD handling fee). Well, as soon as you can! The best vacation rental homes with best prices are the first ones to get booked! Please check the special offers and discount section for information on time limited vacation rental promotions and deals. We also have an early booking special discount if you book six or more months in advance! Do you provide Airport transfer from Cancun Airport? Absolutely! We’d love to assist you in your wedding or honeymoon planning in Riviera Maya. From flower, champagne and candles arrangements to organising romantic dinners at the beach! Please contact us to discuss options. For emergency after-hour service, please call or Whatsapp our Guest Service mobile phone 984 144 2190. If no after-hours and no one immediately answers, leave a message. Our staff frequently check their messages and will respond quickly. Shipping and mail service to the rental home is not authorized. As a courtesy, with advanced authorization, guests may ship small items to our local office and arrange to pick them up during business hours. Our office hours can fluctuate but are generally Monday - Friday 9am - 6pm. This is a courtesy to our guests and requires advance notice. Vimex Vacation Rentals is in no way responsible for lost, stolen or missing items and will not deliver packages to guests. Ship at your own risk! Full name of all the people traveling, address, phone, credit card (Visa, Mastercard), a signed rental agreement and 50% deposit at time of booking. Remaining balance due 30 days before arrival. I f your arrival is in 30 days or less, booking must be paid in full.